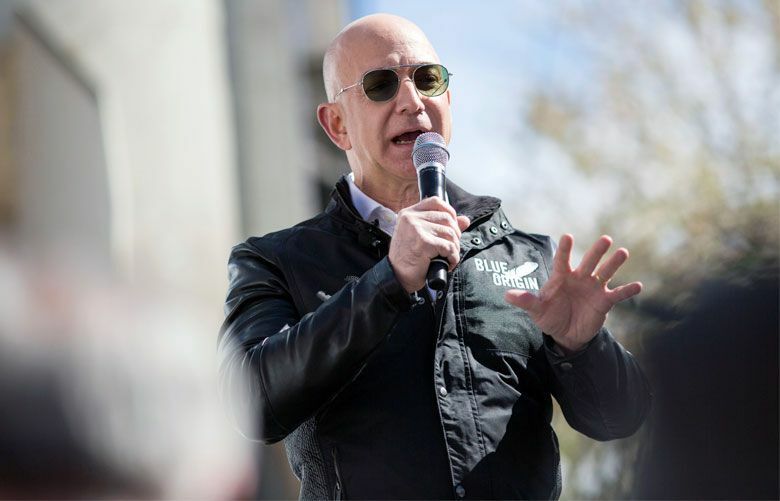 Jeff Bezos, tech’s new style icon? The Amazon titan's wardrobe has sharpened up, becoming very modernist and minimal. It has happened as steadily, and stealthily, as Amazon’s relentless march to vie with Apple for the title of world’s most valuable company. What am I talking about? The ascension, unavoidable when this sort of spotlight falls on you, of Jeff Bezos, aka, the richest man in the world, to full-fledged style icon. You can’t ignore it anymore. As his company’s figurehead, he’s simply too ubiquitous. In the vacuum left by Steve Jobs, amid the uncertain status of the gray T-shirt-and-hoodie proponent Mark Zuckerberg (thanks to Facebook’s changing fortunes), and as an alternative to the Hollywood velvets of Elon Musk and the folksiness of Tim Cook, Bezos offers a new kind of image of a tech titan. It’s a transformation that in many ways is as unexpected as Amazon’s swerves into original moviemaking and web services. Yet there’s no mistaking the New Look. Bezos has gone from a pleated-pants sweatshirt-wearing Smurf to muscled-up, black-polo-shirt-and-shades digi-stud. His thinning mud-brown scruff of hair has been shaved rigorously clean, and his biceps have grown bulgy. His tailoring has narrowed, and he has acquired an entire wardrobe of bomber jackets. His accessories have begun to speak mogul semiology: a Ulysse Nardin Dual Time watch, Garrett Leight Van Buren sunglasses, cowboy boots. His look has become so striking that it has inspired all sort of flowery comparisons to pop culture figures like Pitbull (by Spin) and “Terminator-meets-Vin-Diesel-in-Portland” (BuzzFeed). In 2015, GeekWire voted him best-dressed at the tech summit with President Xi Jinping of China, beating out Cook, Satya Nadella of Microsoft, Zuckerberg, Alibaba’s Jack Ma and LinkedIn co-founder Reid Hoffman, among others. Snaps! What was he thinking? He was apparently already focused on saving time, even in those early years. When did the evolution begin? It’s hard to pinpoint. Possibly around the time Bezos really began to articulate his ambitions to Amazon-ify the fashion world (ambitions that still largely elude him as far as high fashion is concerned, though Morgan Stanley has predicted the company will soon become the largest apparel retailer in the United States). In 2012, he stood on the steps of the Metropolitan Museum of Art in a Tom Ford tuxedo as the honorary chair of the Met Gala. At the time, many people, including this writer, made fun of the conjunction. Perhaps we should have paid more attention to the fact that, in an interview with The New York Times just after the Met event, while Bezos could not remember the make of his shirt or shoes, he did manage to name-check his Prada jeans. Something had changed. 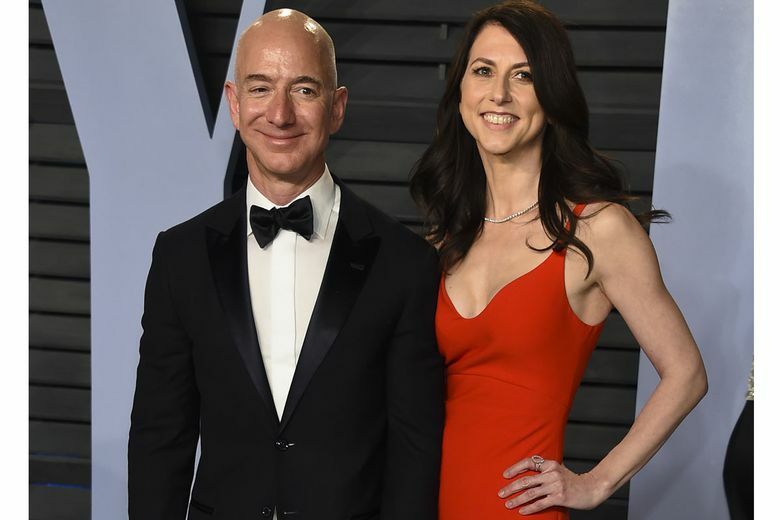 And thus did it continue when he bought The Washington Post the next year, which was followed last year by the purchase of the biggest house in Washington, where it has been suggested that Bezos could become the next Kay Graham. Though perhaps its clearest expression occurred when he joined Instagram in 2017. Many of his posts focus on Blue Origin and Bezos’ dream of spaceflight, though some also acknowledge his evolution in a backhanded way by poking fun, somewhat, at his new style. There he is, for example, arm veins a-popping, next to a poster of the even balder and more built Dwayne Johnson in “Rampage,” with the caption: “Still working on my smolder.” There he is with Patrick Stewart in matching tuxedos at the Vanity Fair Oscars party earlier this year (Bezos is a famous Trekkie), a photo that provoked many commentators to remark on their similarity. There he is in the desert in faded denim, a cowboy hat, those “lucky” cowboy boots (apparently a gift from a friend) and shades leaning against his space capsule and striking a “Right Stuff” pose. And there he is with robot dogs and spaceships, and atop a giant windmill in Amazon’s new wind farm, modeling a hard hat and shades and smashing a Champagne bottle. He is getting more comfortable playing the public role, and costuming himself for it, down to the squared-off handkerchief in his breast pocket when he wears a suit, which he does in the company of political power folk. When around journalists and in his own backyard, he tends to lose the tie and opt for a perfectly fitted sports jacket and contrasting straight trousers. 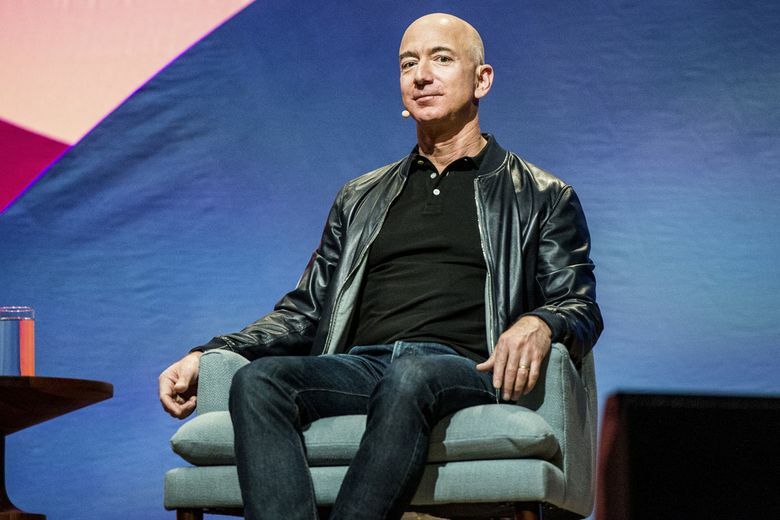 Pointedly, and unlike his fellow tech entrepreneurs who have enshrined the dress-down uniform in the mythology of their sector and equated it with a life of the mind, Bezos has a facility for dressing up. He has also shown a willingness to sample outfits, much as he samples industries, the better to make them his own. It’s an expression of an omnivorous, rather than laserlike, focus. The result is a new model for a major tech entrepreneur. If Amazon does win the race to the trillion-dollar mark, look for it coming soon to a Silicon Alley near you.